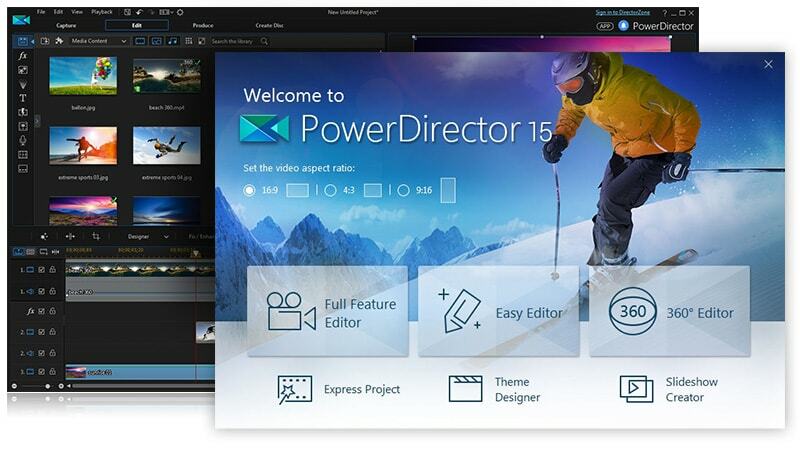 A simple and versatile video editing experience is the base of the CyberLink’s PowerDirector 16. It achieves a delicate balance between creating an interface that is easy for both casual and advanced users and delivering powerful yet simple video editing tools. It gets this by including fully functional tools accessible to editors according to their skill level. The Full Feature Editor consists of storyboard editing modes and classic timeline which offers all the control more advanced users require to achieve the expected result. It also has an easy-to-use Express Projects that walks the new users through a series of preprogrammed video template, which in turn helps the new users to learn how to use the Full Feature Editor at its full potential. This best video editing software is a miniature post-production studio that helps in handling almost everything regarding the films you shoot from your camera to the moment your finished video is either published online or burned on to a disc. Another salient feature is that it provides you lot of options to share your videos on social networks and video sharing sites and can even export them to smartphones or tablets. This is an entry-level program in the PowerDirector line which is perfect for beginners and casual users. In case you advance beyond that point, you can upgrade to the Ultra and Ultimate version of this software to access features like content-aware editing or an action cam centre. To edit your video using this software, there are two ways: The Full Feature Editor or Express Project. If you choose Express project, you will get a library of preprogrammed video templates from which you can choose from. The PowerDirector will walk you through sorting your footage, to choose the best shots in your video and then letting you experiment where the footage is placed in the template. This allows the beginners to complete the project without getting intimidated by the complexity of the software and teaches the user to use the various tools in the Full Feature Editor. In the Full Feature Editor, you can find all the tools any editor will require to transform any video footage into a finished video. The storyboard/class timeline workflow provides the ability to build your own video project in broad strokes using story mode or you can also control all the aspects of the video using the various tools available in timeline mode. Talking about the tools, the ability to trim clips, manipulate pictures, arrange footage on the timeline, inserting transitions and adding effects are present and can be easily understood and used. There is a library of over 500 transitions and effects from which you can choose from. Advanced options also include the ability to stabilize shaky video footage, sync video and audio captured on separate devices, and to design advance titles from video project. Almost every tool that any professional video editor used to make TV shows and Movies are present in this software. The attractive thing about this software is that it can be easily used by anyone regardless of their computer skill or their video editing skills. With simple computer skills, one can easily follow the learning path designed by Cyberlink in the form of Express Projects. Advanced users can skip this and find the tools that they are familiar with. Once you have your finished video, you have to get it in front of an audience who can be your friends or family. You can do so through social media, by sharing the video with the whole world using video sharing sites like YouTube, or burn a disc and give it to anyone you wish. This software provides all the options for sharing your videos. PowerDirector 16 is among the best video editing software according to us because it’s both easy to use for beginners and seasoned editors alike. It also provides almost all the tools you may require to convert your video footage into a polished video which you can share with family and friends. We definitely recommend this software to all those who wish to create good quality video and want to share with the world.